The major task of today was to patch up the gap in the ash pan. Second to that was to couple the loco and tender, because she was due for service on Friday. In order to do other things, the loco had to be over the pit, so Gil, Bruce & John helped to align the three links between loco and tender as the loco was pressed up against the tender buffers and the links engaged. Once the loco was over the pit, carefully positioned so that there was room to clamber down the front of the pit and the water was drained out of the pit, Bruce & John were able to go underneath. They hooked up the hoses (vacuum, water & steam heat) between loco and tender. David had come down to do the welding on the ash pan. To fill the width-wise gap needed several pieces of metal 17" wide and a couple of inches broad. 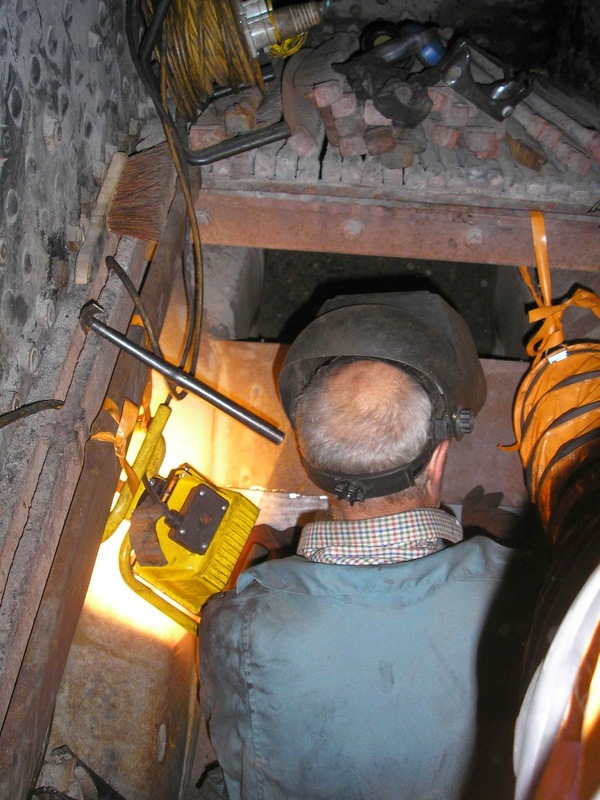 Because the split was on an angle above the damper door, this mean welding one piece vertically, one of the top (kind-of horizontal, and then more to bridge the uneven gap between them Poor David spent most of the day inside the firebox doing the welding! 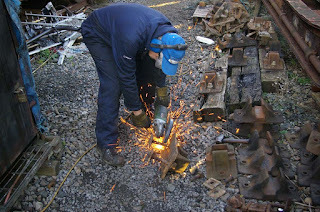 At some point, David found time to check the weld on the smokebox door handle. It seemed that the handle had simple come apart from its boss, rather than having broken. So, he tidied that up. Meanwhile, Gil was on the footplate keeping an eye on David (in the firebox) and acting as gopher. In the attached, you can see that all of the rear fire bars had to be removed, and David was standing in the bottom of the ash pan to do the welding. Because of the fumes, a big orange sucker had to be inserted, and Gil was in charge of the sucking. Bruce and John sought out the marks that we had painted on the wheels & their tyres before going to NYMR to check that the tyres had not slipped on the wheels while up there. Eventually, the marks were found (under the muck) and all is well. Clive (Loco Dept) was so ashamed of the filthy state of the loco that he set to with brush and cleaner, and smartened up the wheels, cross-head and motion. Where was I while this going on? Ah, well, as it was not raining I decided to clean six rail chairs …. As David was finishing welding and putting the fire bars back in, I was able to carry out the "standard" pre-light-up checks - Carpo was to do a steam test on Thursday, in readiness for operational use on Friday; this meant a warming fire was needed today! Several nuts on mudhole doors were loose (as is commonplace), and there is a bit of damp in two corners of the firebox, but nothing else to worry about. So, as soon as David was out, I laid a small fire in the centre of the rear section and set it alight. The Yorkshire coal (still some in the tender) caught rapidly. While the fire took hold, I went for a cuppa. It was nearly 5pm by now. While sitting in our TPO supping my tea and munching a couple of Chocolate Digestives, guess who should visit? Maurice! I've never actually seen Maurice before - only left out food for him. He popped up through a hole in the floor; scurried behind the bucket (that catches rain ingress) and behind the radiator; and straight up to his food. I'd left water plus two x quarters of Chocolate Digestive. He didn't seem to be interested in the water, but grabbed a quarter biscuit in his mouth and scurried off out again! He looked so funny carrying this relatively huge piece of biscuit as he scampered across the floor. If only I'd got the camera ready … By the way, he's a field mouse. By 5.30, the fire was settling down nicely, so I banked it up (though this coal contains an awful lot of slack); carried out the final checks, and left 2807 (and Maurice) for the night. The weather after noon was superb, so I pedalled off round the Cotswold hills; flew down Stanway Hill (touched 31 mph at one point), and called in at Toddington to feed Maurice. 2807 was sat over the pit, simmering away. In the TPO, I put down some more biscuit, and then set to at my favourite job - painting black bottoms! Just for the excitement of it, I also tackled a coil spring. Now, how do you paint the inner surface of the coils? That was a challenge set by JC. I might just have cracked it - let's see how it looks tomorrow! 2807 whistled a couple of times (so it was on the move). Word has spread around the yard that we have some feeler gauges, and a chap called Len, from the Manor group, popped his head in the TPO and asked for a borrow! Maybe we should instigate a lending system - card operated, like libraries used to do some decades ago? Also need to weld the symbols "2807" onto everything that's moveable! There were no new issues listed on the log following yesterday's race train, and 2807 was again in service on Saturday. Bruce kept an ear out as she went by, just to make sure that everything sounded OK.
As there was nothing else for us to do and the weather was fine, we tackled a few more rail chairs. We forced ourselves to stop at eleven chairs - mustn't set expectations too high! Apart from that, I completed painting the spring in red primer. JC delivered some pipe couplings to fit the tender/loco water/vacuum connections and make it easier to disconnect (and connect up) when parting the loco from tender. Len returned the feeler gauges plus gave us a photo of 2807 taken at Shrewsbury and suggested we go to the SVR's photo/postcard event in January. Just as I was leaving, Cliff mentioned that since we had the Tyseley work done on 2807 she is the best engine in the Toddington fleet to drive! Praise indeed.